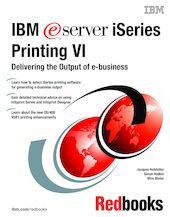 Following on from the successful IBM Redbooks publication "AS/400 Printing V", SG24-2160, this new printing book concentrates on products, methods, and techniques used in delivering the output required by IBM eServer iSeries e-business . It introduces and explains many new printing developments with OS/400 V5R1. In addition, this book offers detailed technical advice on using two of the most significant iSeries printing products for years: Infoprint Server for iSeries and Infoprint Designer for iSeries. Infoprint Server for iSeries extends the capabilities of the iSeries beyond printing, to further enable such e-business requirements as data stream and image transforms, spooled file indexing and segmentation, e-mail and Web-enabling. Infoprint Designer for iSeries provides the long-awaited, fully-graphical document composition interface to Advanced Function Presentation on the iSeries. This book will be of value to iSeries customers, IBM Business Partners, and IT specialists who want to learn about the wealth of new printing and output presentation functions available at OS/400 V5R1. It is the essential guide to delivering the output of e-business.